Four Students were selected this month as the Lava Falls "Triple Diamond Award" students. These students were selected as the students of the month based off of three areas (Program, Academics, and Therapy). These students were all doing well this past month in all 3 areas and got to participate in a benefit with their Campus Director, Travis. They started off the morning going hiking at one of the prettiest places in the world, Zion National Park! After the hike they toured a photography gallery in Zion. We are so lucky at Diamond Ranch to be so close to such naturally beautiful places. The boys LOVED it and couldn't stop talking about how fun it was and how pretty it was in Zion. Following the benefit they went to Dairy Queen, ate lunch, and got ice cream! Stephen (our filmmaker) came along and worked with the boys and will be creating another video from the activity. We will be posting it upon its completion! They were able to see all 3 of the emerald pools! View from behind the waterfall! 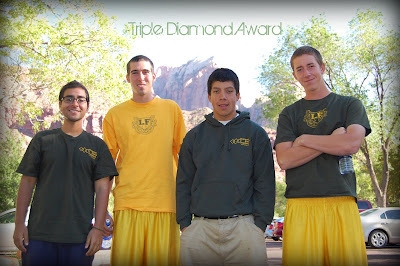 The Lava Falls boys at the "Lone Tree"
Water fight with Zack and David from Sage Canyon! !